ADVERTORIAL: Affiliated to Bowls England and the Kent County Bowls Association, Knockholt Bowling Club can be found in the beautiful surroundings of Ivy Lane in the wonderful village of Knockholt. 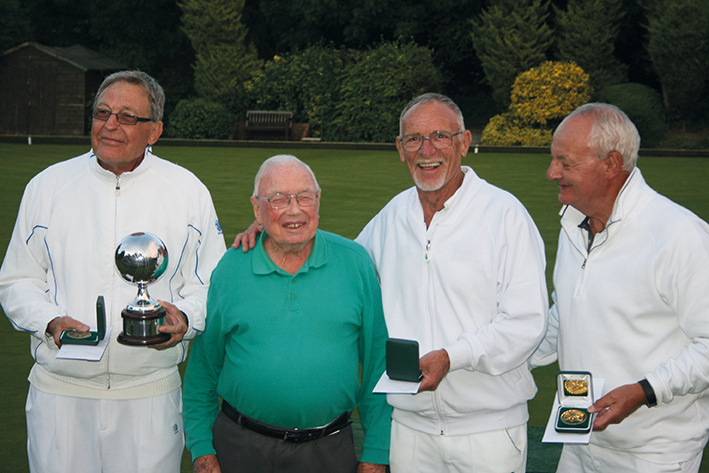 Knockholt Bowling Club is situated at the end of Ivy Lane in Knockholt in a superbly tranquil location. The Club has a well-kept green, pavilion, car park and is the highest bowling green in Kent. The Club was re-formed in 1990, the old Club having ceased playing during the 1950s. The new Club was formed by a dedicated number of Knockholt and Halstead residents, who spent time and money and a lot of hard work building the green and the pavilion. Before the start of the 2018 season there were around eighty club members made up of full playing and social members. They are an open and friendly club where they enjoy an active and vibrant social side with quiz nights, coffee mornings and games evenings, as well the occasional supper after a roll-up evening. The outdoor season runs from late April until the end of September with friendly matches being played most weekends and Wednesdays. There is a roll-up/club night on Tuesday evenings throughout the season for members to enjoy an evening of bowls with or without the competitive element. Some of the Knockholt ladies play league matches on Monday evenings in the West Kent League and some of the men play league matches in the North West Kent League and Sevenoaks and District Leagues. These matches are played on Tuesday, Thursday and Friday evenings. The Club has its own annual club championships where seven titles are up for grabs. Knockholt also hosts three large open tournament days each summer; one for ladies, one for men and also a mixed tournament. These events attract bowling clubs from a wide area including the whole of Kent and south-east London. In addition to league matches, the Club operates a policy of playing mixed friendly matches, all played as triples (three players each team). Their opponents range from Crayford to the north, West Hoathley to the south, Ditton to the east and Purley Bury to the west. The Club is continually striving to encourage new members to join. All are welcome to apply to join, from teenage to any age. It is a game well suited to all ages, giving gentle physical exercise as well as the mental exercise, stimulation and agility which accompanies the physical side. There is also a great opportunity to socialise for a few hours every week. Club members can also use the green to practice whenever they wish and there is no additional charge once the annual fees are paid. The club operates a number of Open Days each summer season when everyone is welcome to come along to discuss issues with Club officials and, more importantly, try their hand at the game. The next Open Day is on the Saturday 12 May starting at 2.30pm, please come along and give it a go. Being a member of a bowls club brings many social benefits and can be used as a lifeline as great friendships can be formed. It also encourages community spirit as all members of the community can enjoy bowls and lead a healthier lifestyle. At Knockholt Bowling Club they try to embody these aspects. Bowls is sport for life – just try it. If you would like to become a member of Knockholt Bowling Club, please contact the Club Secretary, Marilyn Sayer on 01959 571644 or by email at mjsayer@btinternet.com. The Club will be able to provide you with all the equipment you need to try the sport of bowls but please bring along a pair of flat soled shoes for playing on the green.